The Saint Paul Port Authority has contributed to the East Metro’s economic growth for more than 75 years. Through its unique transactional expertise, the Port assembles parcels of polluted or underutilized inner-city land, cleans them up for redevelopment, and then sells them to expansion-minded businesses. Every project requires funding from many public and private groups that invest in the East Metro’s economic health. Each partner lends expertise, time and talent to the mix to clean up the polluted sites. In turn, those sites attract millions of dollars in additional private investment to create new jobs and expand the property tax base. 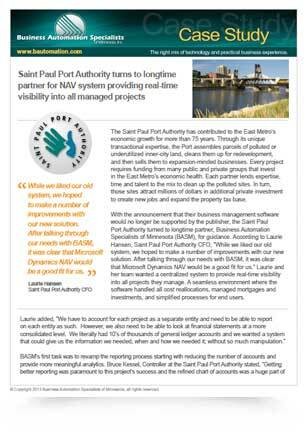 With the announcement that their business management software would no longer be supported by the publisher, the Saint Paul Port Authority turned to longtime partner, Business Automation Specialists of Minnesota (BASM), for guidance. According to Laurie Hansen, Saint Paul Port Authority CFO, “While we liked our old system, we hoped to make a number of improvements with our new solution. After talking through our needs with BASM, it was clear that Microsoft Dynamics NAV would be a good fit for us.” Laurie and her team wanted a centralized system to provide real-time visibility into all projects they manage. A seamless environment where the software handled all cost reallocations, managed mortgages and investments, and simplified processes for end users. Integration of the investments and loans into the ERP system was the last component required to provide a centralized system. In the previous system, St. Paul Port Authority tracked investment activity in a separate, disconnected program and loan amortization schedules, including mortgages, in Excel. They would generate reports from the other program and then post all investment activity in a monthly journal entry for all the activity of each fund and project. Now, NAVInvest and NAVCash provide an integrated solution that tracks and maintains these components within NAV. NAVCash generates billing for payments and allocates the revenue to loan repayment and interest earned. NAVInvest handles the Mark to Market monthly Investment revaluations. As a result of their new system, St. Paul Port Authority received a 25% reduction in their audit fees; a cost savings they will continue to capture annually.